Developed in collaboration with Embry-Riddle Aeronautical University, the world’s leader in aviation and aerospace education, this certification encompasses the study of UAS technologies used to monitor plant growth, evaluate soil conditions, monitor animal operations, develop integrated pest management plans, make fertilizer recommendations, provide yield estimates of agricultural and forage crops, and make forest management decisions using UAS images and data. Industry partners have identified the industry readiness indicators that are measured on the Unmanned Aircraft Systems in Agriculture certification exam. Based on the industry needs and assessment of each indicator, the number of exam items per area have been determined and are noted on the exam guide. Additionally, where applicable, the industry readiness indicators have been correlated with current educational frameworks. The exam guide is designed to assist candidates to prepare to sit for the Unmanned Aircraft Systems in Agriculture certification exam. It includes information about the exam, exam objectives, recommended references and sample items – all with the intent of helping candidates achieve a passing score. AEST recommends a combination of classroom instruction and self-study to maximize a candidate’s chance of earning industry certification. 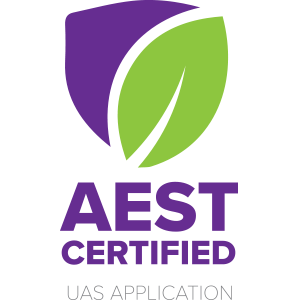 References and secondary resources posted on AEST’s website are available for candidates to use to prepare to sit for the Unmanned Aircraft Systems in Agriculture industry certification exam, though other resources may be used to effectively prepare as well.